A Federal High Court in Abuja has granted embattled National Publicity Secretary of PDP, Olisa Metuh, a N400million bail. Olisa is being tried for receiving N400 million from the $2.1 billion arms deal fraudand somewhat looks like a repayment plan against proceedings of the freed Olisa refuting his involvement with such shady transactions. Time shall tell... . 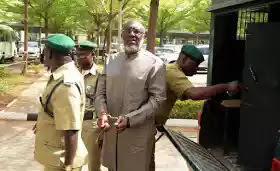 The judge also ordered Metuh to submit his international passport and that as part of his bail conditions, he must provide two sureties with N200 million each. The sureties must have properties in Maitama district of Abuja.